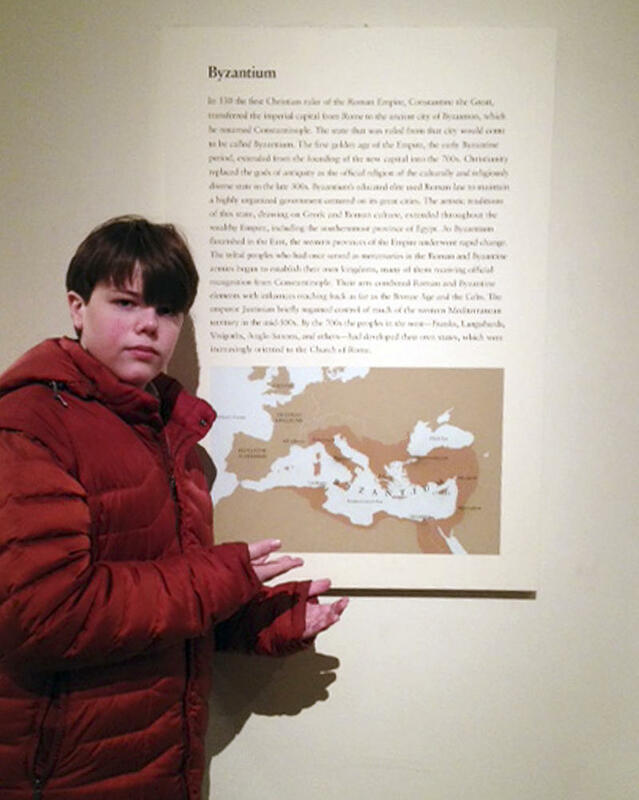 WEST HARTFORD, Conn. (AP) — A Connecticut seventh-grader says workers at the Metropolitan Museum of Art in New York City didn't believe him when he pointed out an inaccuracy with a map that was on exhibit. The map purported to show the Byzantine Empire at its largest size in the 6th century, but he noticed that Spain and part of Africa were missing from the depiction. Benjamin Lerman Coady knew he was right, because he had just studied the empire in school before last summer's trip to the museum with his mother. He was told to fill out a form. "The front desk didn't believe me," Benjamin told The Hartford Courant. "I'm only a kid." The 13-year-old West Hartford resident filled out the form and never expected a response, but a museum official wrote him in September saying his comments were under review. Then came an email in January from Helen Evans, the museum's curator for Byzantine art. "You are, of course, correct about the boundaries of the Byzantine Empire under Justinian," Evans wrote, and she invited Benjamin to return to the museum. Benjamin took up the offer and met Evans at the museum in February. He brought her notepads from his school, and Evans gave him a tour of the museum including a sneak preview of a new exhibit. She also asked Benjamin to draw what the map should really look like. He's still working on that project. Evans said this week that the museum is still deciding what to do about the error, including possibly displaying other maps reflecting the empire's history. She said the mistake probably stems from a map reprint a few years ago. "It may be the makings of a young historian," Evans told the Courant about Benjamin's actions. The teen likes history, but said he has other things in mind for a career. "I want to move to Greenwich and open a modern exotic car shop," he said. His mother, Joanne Lerman, told The Associated Press on Friday that her son is at a leadership camp this week with his Renbrook School classmates and had no idea that he's the subject of national news stories. "He's going to be floored," she said, predicting her son's reaction to all the publicity. "He was just happy receiving the letter from the museum and the recognition from the museum. I'm proud."